Be the first to share your favorite memory, photo or story of Flois. This memorial page is dedicated for family, friends and future generations to celebrate the life of their loved one. Fair Play – Flois Thrift Wood, 78, wife of Jesse William Wood, of 436 West Fair Play Blvd., passed away Sunday, December 2, 2018 at Pruitt Health in Pickens, Sc. Born in Oconee County, SC, to the late Burt and Nettie Phillips Thrift. She was a homemaker and a member of New Hope Baptist Church. 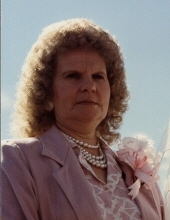 Mrs. Wood is survived by her husband, Jesse William Wood; children; Wanda Cantrell (Paul) of Walhalla, Clark Wood (Teresa) of Townville, Allen Wood (Dale) of Fair Play, Cherri Segars (Ray) of Royston, Ga, and Phillip Wood (Nina) of Fair Play; brothers, W. J. Thrift of Salem, Rufus Thrift of Seneca; sister, Lois Dixon of Clayton, Ga. Twelve grandchildren and seventeen great-grandchildren. In addition to her parents, she is preceded in death by three brothers; Raymond, Rance, and Ronnie Thrift and a sister, Flora Holcombe. The family will receive friends from 6-8 pm, Wednesday, December 5, 2018. A funeral service will be held at 11 am, Thursday, December 6, 2018 at the Sandifer Funeral Home Chapel. Entombment to follow at Heritage Memorial Gardens. The family is at the home of Phillip Wood, 108 Brandon Drive, Fair Play, SC. Flowers are accepted. Condolences may be expressed online by visiting www.sandiferfuneralhome.com. To send flowers or a remembrance gift to the family of Flois Thrift Wood, please visit our Tribute Store. "Email Address" would like to share the life celebration of Flois Thrift Wood. Click on the "link" to go to share a favorite memory or leave a condolence message for the family.